Grave Matters: Smithsonian Institute, Washington D.C. Photos by Anne Peters © Anne Peters 2002; all rights reserved. 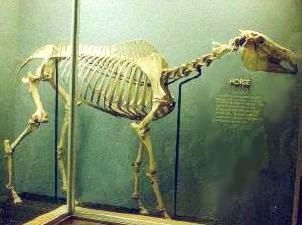 Skeleton of Lexington on display at Smithsonian Institute, Washington, D.C.; originally buried at Woodburn Stud, Midway, Kentucky. Probably the most important American breeding farm of all time, WOODBURN STUD was in its heyday in the second half of the 1800s, under the ownership of R.A. Alexander and later his brother, A.J. Alexander. During this time, LEXINGTON ruled as America's leading sire 16 times, overshadowing his stablemate Australian. Lexington was buried in front of his stone stable, but was exhumed a year later and his bones are now on display at the Smithsonian Institute in Washington, D.C.
AUSTRALIAN and other Woodburn sires such as ASTEROID and PLANET were also said to be buried on the farm, but in unmarked graves in unknown locations. -- A.P.